The Mercedes Benz E Class has always been a technical tour de force and the 10th generation is no different. The latest additions include enhanced self driving ability, digital dashboard, touch sensitive controls on the steering wheel, a 9 speed automatic gearbox, and of most interest here a new plug-in hybrid drivetrain with sat nav integration. The Mercedes hybrid system involves integrating the electric motor with the automatic gearbox which leads to a particularly compact design. The downside of this layout is that the electric motor needs to be compact resulting in less power. However whilst it ‘only’ produces 80 bhp the 325 lb ft of torque is very welcome. The electric motor is designed to work seamlessly with both the 4 cylinder 2 litre turbo petrol engine and the 9 speed automatic gearbox. Of course thanks to the 6.2 kWh (net) battery pack it can also run in electric only mode for between 11 to 21 miles. Once depleted the system functions as a hybrid blending the different power sources to suit conditions. In order to optimise electric running (which is the bit that saves you lots of money) the system can use a chosen Sat Nav route to decide when to deploy electric power, when to save or recharge the batteries and when petrol running is the best option. It also uses this trick to decide which gear to select from the 9 on offer. This happens seamlessly in the background, but the E Class is also capable of dropping efficiency hints to the driver via the haptic accelerator pedal. Using a barrage of sensors it will tell you when you should lift off the power if it detects a slower moving car ahead to allow the regenerative braking system to be maximised. It also provides a pulse point in the pedal throw which tells you when you have maximised electric power. You can push through it but the petrol engine will start up. 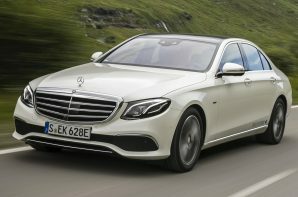 The E350e is very, very clever, very well appointed and undoubtedly one of the finest executive saloons available. Whether it makes sense or not depends entirely on your driving habits. If you can maximise the 11 – 21 mile electric range it could be a brilliant option. If not you won’t get anything near the official fuel consumption and so your savings go up in (exhaust)smoke. It is a shame that Mercedes hasn’t been able to eek out a longer range, something closer to 30 miles would make it more viable for more people.